Happy Thursday! It’s almost the weekend which I’m extra excited about because it’s my birthday on Sunday! I can’t wait to celebrate with my family!! Someone asked me how old I was turning the other day and I had to go back and count. I’m losing track! I never thought I would be that person who forgets how old they are but I couldn’t remember if I was turning 26 or 27 this year haha! 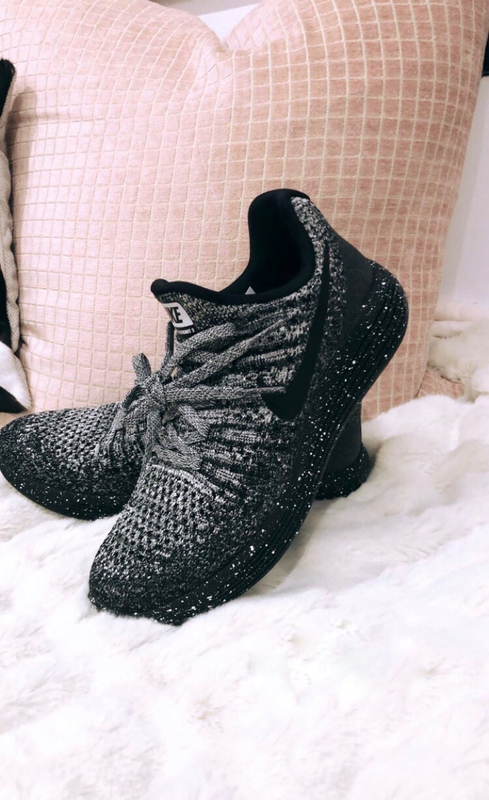 I thought I would give a little fitness update and share some of my favorite fitness items since so many of you have shared your stories with me and have been messaging me about BBG, the workout program I’ve been doing since May. Ok, so I’m sure you’ve all seen these but above I included some of my progress photos I’ve taken through this journey. I started with the classic BBG program on the Sweat app and I’m currently on my fourth round (or BBG 2.0). On Monday Kayla the creator is starting her twelve week challenge with the community of women who follow her program. If you’re looking to start, now is the perfect time with the challenge!! I’m starting the BBG Stronger program on Monday which focuses a little more on weight resistance training to build more muscle. Now that I shed off all the baby weight I want to tone up a little bit more. However, if you’re first starting I would start with the classic BBG and once you finish the 12 weeks re-evaluate and see if you want to keep going to 2.o or try the Stronger or PWR program. You can download PDF’s of Kayla’s workouts or you can purchase the App. I would highly recommend downloading the Sweat app, you can also find it on her website here. You can track your progress, time your workouts, watch Kayla do the moves so you know exactly what to do and she has a food section full of recipes as well! Another fun feature on the app are the challenges. Each week she has a challenge you can complete as an extra to your planned workouts. I just started adding the challenges in about a month ago and have noticed such a difference. I’ve loved it!! so good for me mentally and physically! The app is definitely worth it! These and these are my favorite shoes to workout in. I have them in like five different colors haha. Drew thinks I’m ridiculous but I always snag them on sale and they are so comfortable. The top of them feel more like socks than shoes and the bottom part is so cushiony. I hurt the heels of my feet really bad when I was in high school. I danced on the dance team and in the routine I was supposed to do a round off back tuck. I landed my tuck on my heels super hard and ever since my heels are still so sensitive and start to ached sometimes. These shoes are the only ones that my heels don’t hurt in and they move so well. You can shop them on Nords (love this color too) or Nike! I also mentioned this but right now I’m drinking half of my weight in ounces of water a day. My favorite water bottle I use is this CamelBak. It’s holds more ounces and I love the color!! Also I can down the water way faster with the straw! I find all my healthy recipes for all of my meals from the nutrition section on the Sweat app, Fitness Carli’s meal plan and Clean Simple Eats. My favorite app for counting calories is Lose it! I’m big into counting but it’s such a personal preference; it’s a game to me and I’m such a numbers person so I love to hit my numbers. I have to count because I realized a lot of times I was under eating and I didn’t even realize it. Or I wouldn’t eat anything all day because I got busy and then I would eat a massive dinner that wasn’t healthy. I am now nourishing my body and giving it everything it needs instead of depriving. I would not consider it a diet at all either, more of a lifestyle change that’s sustainble and I actually eat more frequently now than I did before I started this health kick. Let me know in the comment section if you have any other questions!! Happpy Birthday to you! Looking fabulous for that SPECIAL birthday coming up! ???? You are so inspiring! You look amazing! Silly question but in your other post you said you did the 14 min circuits vs the 7 min ones? How do you change that? I cant find it anywhere!!! 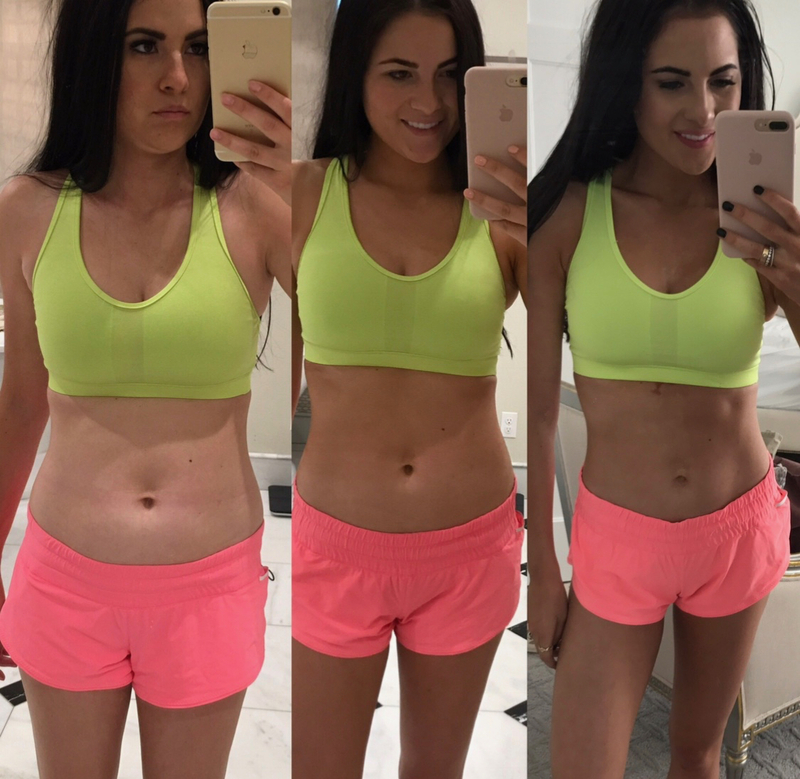 BBG looks like such a cool plan to follow, loving the before and after photos – you look amazing! How many calories per day do you aim for? Oh also are you still running rEgularly? Im Now on week 2 of bbg with the app and i love it! You inSpired me to start afTer seeing yoir reSults!! Happy early birthday!!! You look incredible! I’ve started BBG myself and hoping I can stay on it! 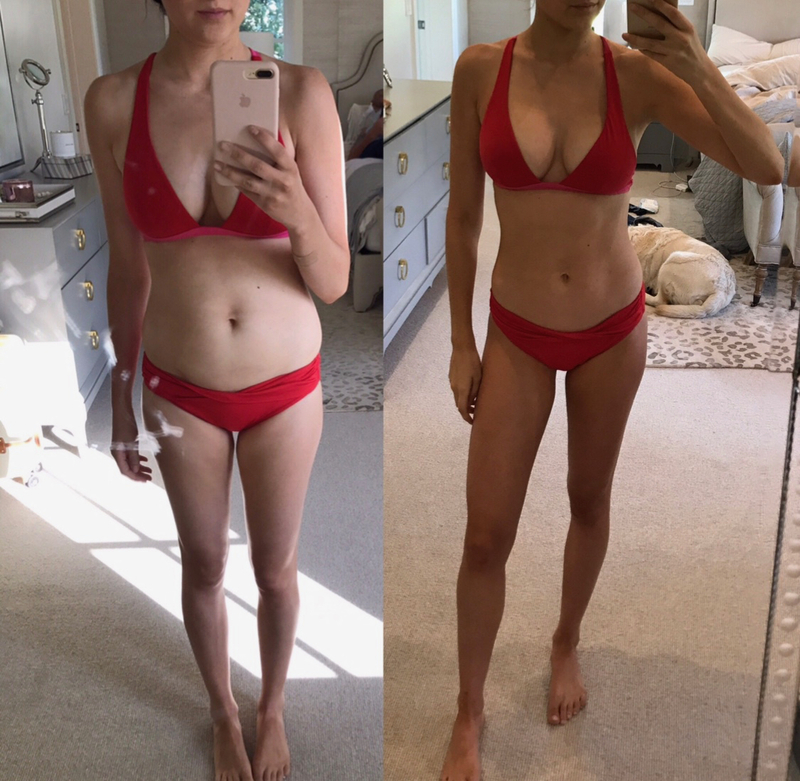 I love seeing your progress pictures! I have two babies very close in age to your two, and totally understand how demanding it is, trying to be a good Mom and wife, and also stay in shape… plus run a successful blog! (Yours is way way more successful than mine! hahaha But I’m still trying!) THe point is, it’s a lot, and I really appreciate seeing your handle it all so well. It’s so motivating for this momma, and I’m really impressed by your dedication and work ethic. Thanks so much for sharing!! How did you mOdify your workouts for diastasis recti till it was resolved? I am 20 weeks with my second baby and my diastasis recTi is already back… I want to try the BBG pRogram At the End of the SUmmer once I have rested from baby 2 but Want to be careful of my DR!!! I am wondering the same thing. I thiught i had read that you did modified abs initially, did you use a speciFic workOut? Thanks! hey rach! Did you do 2 rounds of weeks 1-12 before moving on to 2 rounds of 13-24? or did you go from weeks 1-12 straight to 13-24 and did the 24 weeks twice? I ordered those nikes after you suggested them a week or so ago. I got them in the mail yesterday and I love them. they really are comfortable and worth the price (although i admit I got them on sale). i really enjoy these health/fitness posts! the sweat app, i’m totally downloading it. One queStion…..how many times a week do you work out. You look fabulous and you’re such an inspiration. I have one question for you -do you work out when you’re sick? How do you find the energy to do it? I suffer from allergies that often become a cold and it’s hard for me to be consistent since i lack the energy to go to the gym or even work out at home. If you have any recommendations, please share, I’m tired of skipping workouts. I beli you had ment you modifi the ab workOuts due to diastasis recti. Would you mind sharing what those excercises were? Are you still modifyiNg? Thanks! Ugh! ☝? Autocompletion. *mentioned modifying the ab workouts. You look great girl! I have to try out this program!! Hey Rach! DId you do two rounds of weeks 1-12 before moving on to 2 rounds of 13-24? or did you go from weeks 1-12 straight to 13-24 and did the entire 24 weeks twice?! Great job, you look fantastic! Just curious about your tracking, where are your numbers at? daily calories, macros? also, happy early birthday! Has this workout been ok for your knees? I have bad knees, and i need ro be more active. Thank you! Do you follow Kayla’s food recommendations exactly? Can you share a typical day of what you eat? Love this post and every time you post about bbg i get so inspired!! do you use an apple watch to track everything?! thanks for sharing! Do you have any playlist RECOMMENDATIONS that you can share for BBG? I’m on week 5 and I feel like my music is getting a bit stale, but I totally feel that having a good song can push you through a tough workout! I’ve done one round of BBG, but I didnt time myself, just completed each ciruit Do you use the 7 minute timer and do as many reps as you can, or do you just get through the ciruit and move to circuit 2? Happy early birthday! I would love to know your favoRite running leggings- i think you said at one time they were lululemon? Do you know which one? Thank you!! ? What is your calorie inktake per day? I am also curious if BBG can be modified to Be safe for recovering diastasis recti mamaS. Thanks! Wow you look amazing, this is really incredible. Thanks for sharing these photos are major fitness motivation! So Are you turn 26 or 27!? I’m turnig 27 on May. I got married 2 months before turning 22. How olD were you when you got mArried? I have another question that might be A little bizarre. How many inches Are your calVeS?? Happy birthday!! And good luck doing the challenge! By the way your progreSs is incredible and you look amazing! Keep the hard work. i’m also a bbg-er, but you inspired me to become a 6am bbg-er! now i’m on the hunt for a cute gym bag big enough to carry my work clothes for after, + shower and hair accessories, makeup, gym shoes, etc. i would love some leads on practical but cute gym bag options! Hey rach – I’m curious how you worked in half marathon training while doing BBG. did you just increase your runs during the cardio days? I’ve been doing BBG for 3 weeks now and love it! just wondering, how many laps do you normally get through? I can not seem to get more than 2 or 2.5 in each 7 min circuit and am just wondering for comparison sake. YOu look AMAZING aNd are such an Inspiration! I just started BBG and found its really hard! 10 rounds are hard fOr me to start, did you push it right off the bat or did you work into it? With BBG, how many laps per circuit do you complete on average? I Had my Second baby 8 monThs ago and am Still struggling to lose my weight. I REMEMBER you saying you had Diastasis RecTi and i do too so im WONDERING how You altered the stomach exercises In BBg… your results are amazing & inspiring! HEy rach! Where can i download the PDF’s for the workouts? Also, you said you do the workouts with your GIRLFRIENDS as a GroUp…are there classes you attend or you just follow the ones on the app? So you drink how many oz fl per day??? I just do the count for myself and it turn out 970 oz fl…i think i’m wrong (i’m not good with the conversion from oz to liters…) Thank you!!!! You are quickly becoming One of my favorite bloggers. I just love you content! What brand running shoe di you use? The look like ASICs? Wow! You are such an inspiration! I also love fitness carli’s meal plan. It’s healthy but super easy. 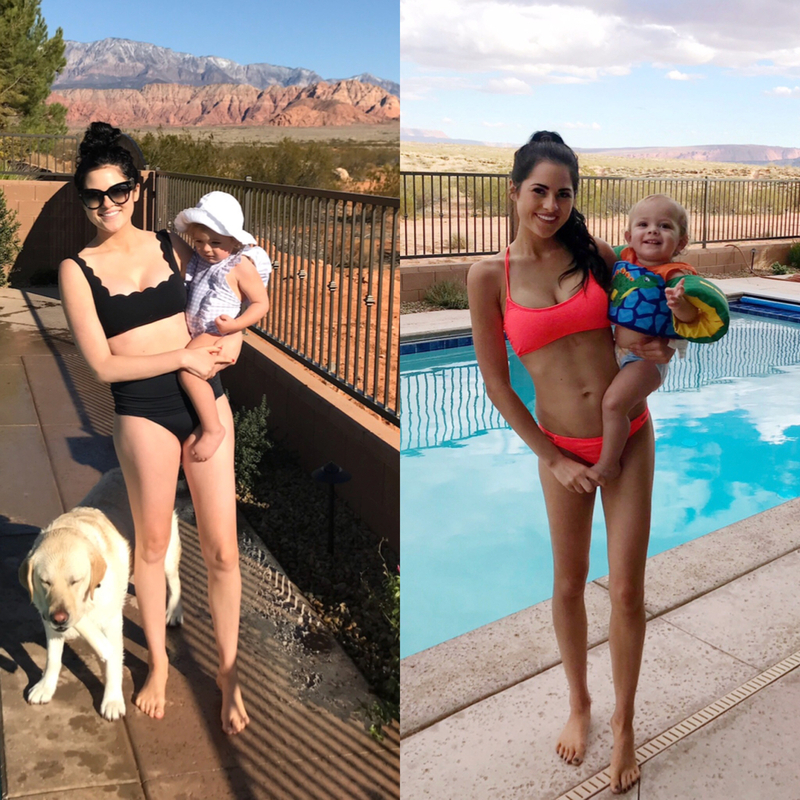 What brand is your pink swimsuit (Nov 2016 vs. 2017 picture above)? It looks like a great option when your chasing kids around! Hi Rach – your journey has been so INSPIRING! Even when you post a quick snapshot from your workout in the mornings has inspired me to get my workout done for the day. I have downloaded the BBG sweat app and have a question… so with each 7 minute circuit are you only supposed to only do each of the 4 excerises once thru? or are you supposed to keep repeating those same 4 excerises as many times as you can in 7 minutes? I feel like some days I’m completing the 4 excerises (depending on what it is) with a few minutes to rest, but other days i’m dying and barely get thru the whole circuit once before time is up? Hi! You look amazIng! And seeing your progrEssion makes me want to do the Bbg too. You said that on monday kayla starts the program. But if i download the sweat app, am I only allowed to join when she starts On monday? Or can i join at aNytime? What i don’t understand is how you do BBG? No one ever talks about this. Do you use your iphone? an ipad? a computer? Im in school and when i don’t touch my screen often enough to refresh it goes dark/turns off. Doesn’t this happen during bbg? Also, would you include more of what you’re eating in your content? Like, not even dinner recipes. like, real/practical breakfast and lunches for a busy mom thats always in motion. what are you really eating for lunch and breakfast while maintaining health? Im sure it’s nothing fancy. thats what i am looking for. more food tips/meal tips please. love your blog. it’s my absolute fave!! Happy early birthday. enjoy your weekend. Rachel, you look amazing! I’ve been looking for a new fitness app to try and I love your recommendations. I usually use MyFitnessPal for tracking my food, but I’ll have to take a look at the app you recommended. just downloaded Sweat, it so I’ll definitely check it out tonight. Thanks for sharing! Curious…whats your calorie count? Do you keep it the same with exercise or do you add calories if you work out? Do you do lots of mini meals, 3 meals? I believe you have to pay for the BBG app monthly or yeArly, whereas iF you by the PDF, you pay one flat fee and may be eligible for a student DISCOUNT. You go girl! You look great! Such great inspiration! Do you drink alcohol when your counting CALORIES? I’ve noticed it can add up so quickly! What are your diAStasis recti modifications for bbg? I love the program, but my dr has gotten worse. Thanks! Do you use a lot of weights? I judt finished a round of BBG and im on week 1 of 2.0. I Feel like i didnt Notice a big dIfference So im wondering if i need to use heavier weights? What helped you? You Look aMazinG! do you do protein shakes? or pre-workout? If so, what is your favorite brand(s). I am on the hunt for something new. thanks! So inspiring! I also am wondering how you did With diAstisis recti? I Am worried its getting worse. Thank you! !